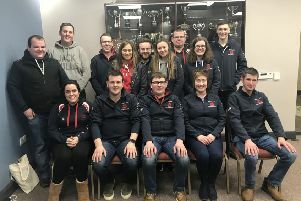 Trillick and District YFC’s annual general meeting was conducted by Tyrone county chairman Adam Wilson. Following a comprehensive report of the club’s activities since January 2018 by the secretary Judith McKinley and a very satisfactory treasurer’s report from Treasurer Shannen Vance the following officers were elected. John Armstrong also currently serves as Tyrone county treasurer and Judith McKinley as assistant county secretary. Jake Cunningham is a member of the YFCU project and development committee. Recently the club was saddened to hear of the death of esteemed vice president Mr J S Henderson BEM and extend sincere sympathy to his wife and family circle. 2018 was an eventful year for Trillick and District YFC with successes at county and Northern Ireland level, opportunities for travel and training through the YFCU, many social evenings out and even some romance. A wide variety of club meetings included club exchanges with Moneymore YFC, a visit to the new PSNI station in Omagh, talks from the NI fire and Rescue service and on dairy farming in Saudi Arabia and a spooky Halloween night at the Ulster American Folk Park. Events involving the whole community including the club’s annual quiz, car treasure hunt and wet knock out were well supported. Funds raised helped the club support the YFCU presidents’ appeal for Air Ambulance NI. At Northern Ireland level John Edgar was second in the silage making competition and Judith McKinley was third in the home management finals. 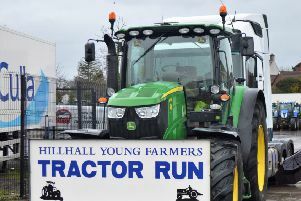 The Trillick and District YFC team were placed second in the finals of the YFCU Build It competition. At the stockjudging finals in their respective sections members placed were: Dairy, Bryan McKinley, third, sheep, Jamie McCutcheon, third and Jack Armstrong, fourth, and in the silage assessment Kimi Chambers was third, Charlie Henderson was fourth and Jack Armstrong was also fourth. Shannen Vance was second in the Northern Ireland final for impromptu public speaking with Judith McKinley, third. The club choir, conducted by Rebecca Mulligan and accompanied by Nikki Browne also took part in the YFCU choir competition. At county Level the club was placed third in the Tyrone Superclub Competition and at the annual efficiency awards Bryan McKinley was judged third, club leader, John Armstrong was third, treasurer and Jack Henderson third, PRO. At the county dinner Shannen Vance was awarded the title of Miss Tyrone. Judith McKinley gained the best senior actress award at the Tyrone Rosebowl competition and received a YFCU acting award. Judith also spent an exciting weekend in Co Tipperary representing Tyrone at the Miss Macra Competition. At the area floral art heats Shannen was placed third and Judith who was first and they will compete in the finals at Balmoral. At the Omagh Show Megan Birney received first place for floral art while Emma Gibson was third. The club poster received second prize. Trillick and District YFC’s sports team also achieved success in 2018 with the junior boys and the girls football teams gaining first in Tyrone and the senior boys third. The senior girls also played in the finals at Balmoral Show. Members who enjoyed opportunities for travel with the YFCU were John Armstrong who was awarded a short term exchange to England and Dean O’Neill, Stephen Clements and Bryan McKinley who went to Rotterdam on the YFCU agri trip. During the year Jack Henderson and Jack Armstrong participated in the PA1 pesticides courses through the YFCU, Judith McKinley and John Armstrong undertook child protection training and Jack Henderson and Jamie Morrow went on the Dunbia tour. 2018 ended romantically with the wedding of club member John Edgar to Hayley Lowry and the engagement of Julian and Emma-Louise. Trillick and District YFC members are now looking forward to celebrating the club’s 55th anniversary with a dinner dance on Friday, February 8th in the Woodhill Hunting Lodge, Irvinestown. Former members and friends of the club who would like to attend should contact the secretary on 07730368630.